This one of a kind Unit #1A is charming and conveniently located. It can comfortably accommodate up to 5 people with a queen size bed in the bedroom, a queen size sleeper sofa and 2 stowaway twin sleeper ottomans in the living room, as well as 2 full bathrooms. 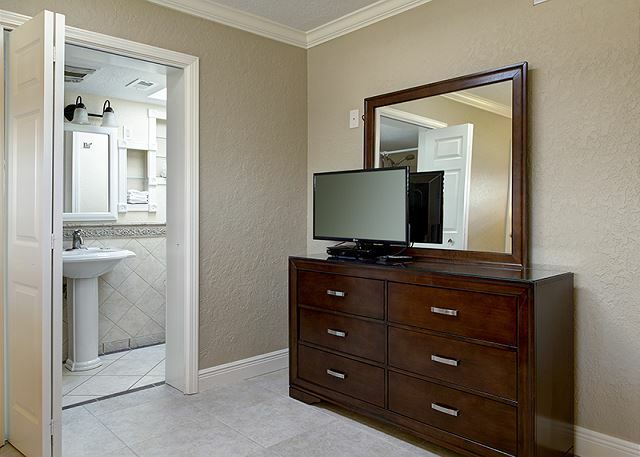 Tile floors are featured throughout the unit. Unit #1A is unlike any other condo at Holiday Surf & Racquet Club because it has its own private fenced in patio area! It is a ground floor unit providing easy access to the beach, pool, tennis courts and parking lot without the hassle of elevators or stairs. 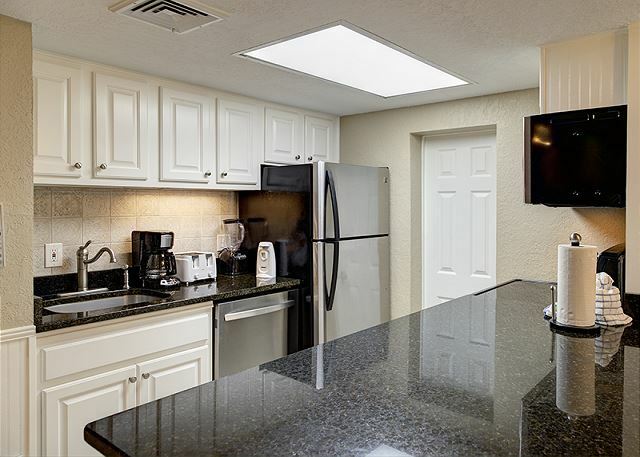 Although this unit does not have a Gulf view, it offers many conveniences for your stay which includes an elegant kitchen featuring stainless steel appliances and granite counter tops. An entertainment system offering a 47” LED TV and Blu-Ray DVD player in the living room and 32” flat-screen TV and Blu-Ray DVD player in the bedroom. It has a sunroom overlooking your own fenced in courtyard. 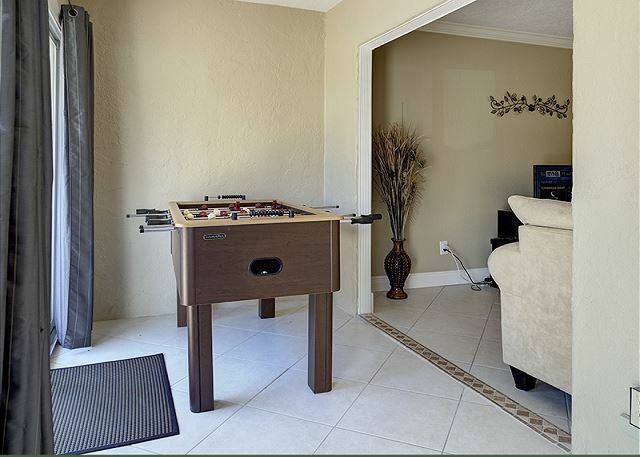 As an added feature, there is a foosball table in the sunroom for your entertainment. 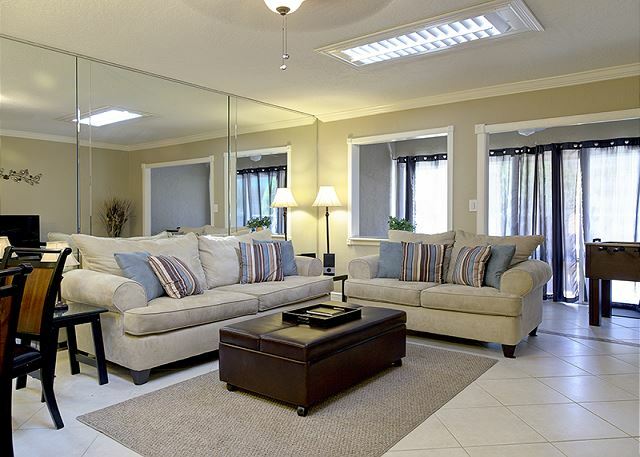 The sky-lights and tile floors throughout the entire unit will make your stay very cozy and pleasant. To make your lodging away from home more complete, you’ll have your own High-Efficiency washer and dryer in the laundry room, wireless internet access, and a charcoal grill & smoker in your private courtyard! Make your reservations today for a well-deserved relaxing vacation. 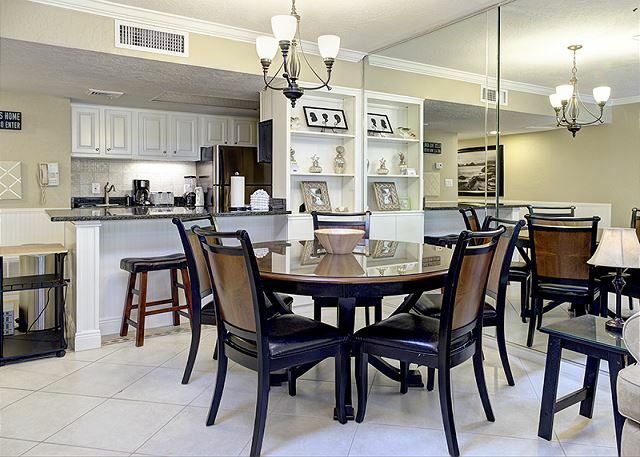 Be steps away from the white sand of beautiful Destin beach! Winter Guests Welcome! Take advantage of complimentary Xplorie excursions to enhance your vacation. It was good. The condo was clean and looked just like viewed on-line. 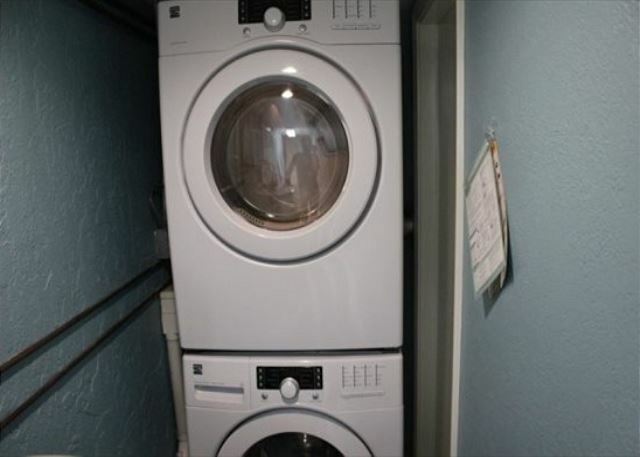 Well-stocked kitchen, comfortable bed, nice to have washer/dryer in unit and two bathrooms. Enjoyed the private patio. Suggestions: More lighting in LR and an easy chair/ recliner; some lawn chairs w/arms on patio. Staff was friendly and helpful. Glad you enjoyed your stay. We appreciate the suggestions as well. This unit provides the private oasis feel with the patio. Please join us again soon. Nice unit, convenient and separated from the main building. Easy parking, no steps or elevator to deal with. Clean. Only suggestion is to place some functional lighting on the sidewalk going into the unit. Landscape lighting was not working and we could not see . Great place but the parking is out of hand. There is not enough!! Good luck. We had a great time. We are a family of 4 and it was just the right size. We were glad it had 2 bathrooms and the boys took the sofa and the pull out bed. This unit is by itself but it was nice we could park and go in the back door. It was also a short walk to the beach. It was easy to go back for something if you had to. The beach was beautiful. It was not that crowded and we loved that it came with two chairs and an umbrella. We will be back! My husband and I absolutely loved this place. It was a great relaxing getaway for our first anniversary. We felt right at home and will definitely book this rental again! We had a wonderful time the condo was very nice and clean. We would definitely recommend your property.